Looks like the Topfield Australia Forum has been taken off line. I am surprised it has survived this long - it has been almost 2 years since Toppro went bust. That will save your morning trip over there every day to redirect users ..
Yeah,shame to see Topfields demise,hope this Forum kicks on for a few years. Fred, the forum cost me less than a cup of coffee a week to run, so I will keep it going so long as there are users who want to take advantage of it. It cost so little that it is not worth the effort of putting a paywall in place. Hi , ive only just joined this forum but i cannot see where I can post a new topic so apologies to all. Ive done a search here but i cannot find any info on my TF5000PVRt Masterpiece that I need some advice on ...could anyone please assist? Thank u! It shows when you go back to 'Categories',top right hand corner,10cm under your name. Have Topfield completely exited the PVR market? A look at the Korean site shows Medical / Bio / Computer kiosks and some security camera systems. Not a PVR in sight. Yes I think they have. The closed their European operations about the same time as the Australian operation closed down. For a while they has some token information about PVRs. At one stage there was talk of hiving of the PVR operations but as far as I know nothing happened. I have not been in for a while, bit mystified what is going on here, cannot see where to now post new topics, or has it been moved to this WikiTop site? btw, my issue is that I just bought a Kogan TV, and as bad luck would have it the two RC signals are obviously close in frequency or wtf and are conflicting with each other..both ways...becoming a nuisance. 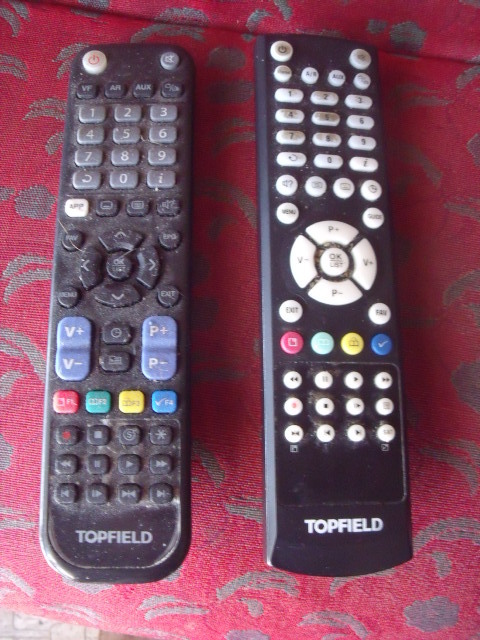 is there any secondary signal set etting on the topfield remote? My recollection is that the TRF-2100 supports two difference RCU codes. Just had a look at the oztoppy wiki and see that it supports the TP-304 (mode 4 - which I think was the one that shipped with them) and the TP-800 (mode 6). The TP-804 is an updated version of the TP-304. The TP800, TP850 should work without problems and possibly the TP-602. If you have a Universal RCU, then look at the Toppy model numbers that support those RCUs - see listing here. This will not avoid the Kogan interfering with the 2100, but will hopefully prevent the Kogan from interfering with the 2100. There is no way to limit the 2100 to mode 6 - I assume the interference is with mode 4 but not sufficient information to work that out. Another possibility is that the Kogan may support multiple RCUs, but I do not recall seeing a TV with selectable RCUs. the cleaner of the two RCs in pic is the one still in everyday use, the grubby-looking one is the benched one..
so you think going back to the other style RC might half solve the problem? I've looked through the newly arrived Kogan set's menu, and i cannot spot any entry regarding switching RC signal-sets..but even one-way relief of this issue is better than none..
some UK newspaper tech column artice which came up when I googled the issue suggested that after-market RCs often solve the problem because having a more precise narrower wavelength/frequency selector than the genuine factory-brand supplied ones do, but also said like you seem to be saying, that there is not usually any 100% solution to this.. I've never encountered it b4..closest I came is that me using any RC in lounge tends to trigger the stand-by saver on the TV in the next room, and put that TV into an unwanted stand-by mode, until it times out..which can take 30 mins or more on that particular stand-by saver module...closing that bedroom door seems to block that signal prowling down into the bedroom from the next room..